Bryan is a man of immediacy, of action. He has a reserve of motivation constantly seeking an application. At 19 he excavated his dad's 35-year-old Raleigh from the garage and promptly started riding the 25-miles to work and school and back. "I loved it, riding for an hour and half each way with just my bike and my thoughts. It was beautiful." With the right effort he says, anything is possible. Bryan grew up just across the Golden Gate Bridge from San Francisco, experimented briefly with Southern California's omnipresent sun, and came promptly back to the temperate Bay. 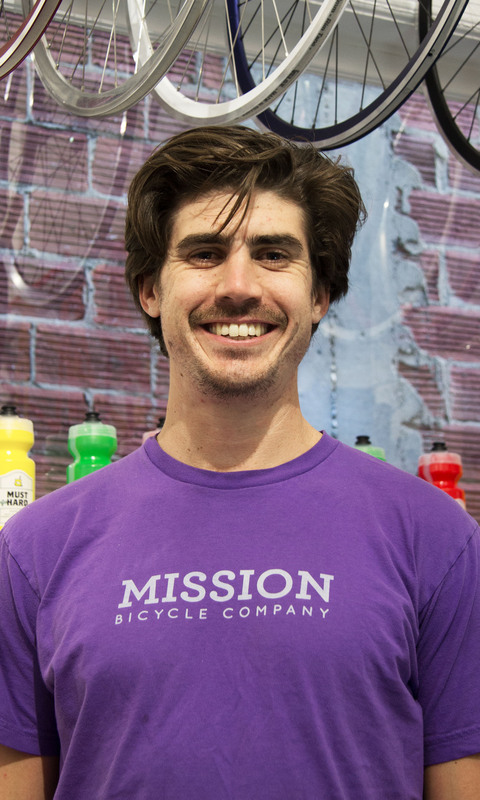 He's worked in veterinary care, studied environmental conservation, and guided visitors all over SF on bicycle tours. Bryan is a natural commuter advocate inside the shop. He specializes in guiding customers to the intersection of what they need and what they want. Outside the shop, he's also our lead tour guide. Regardless of location, he makes everyone smile. "Bikes aren't just a mode of transportation, they're the most fun mode available." Bryan is the only staffer to ride a bike from New York to San Francisco... in 49 days.